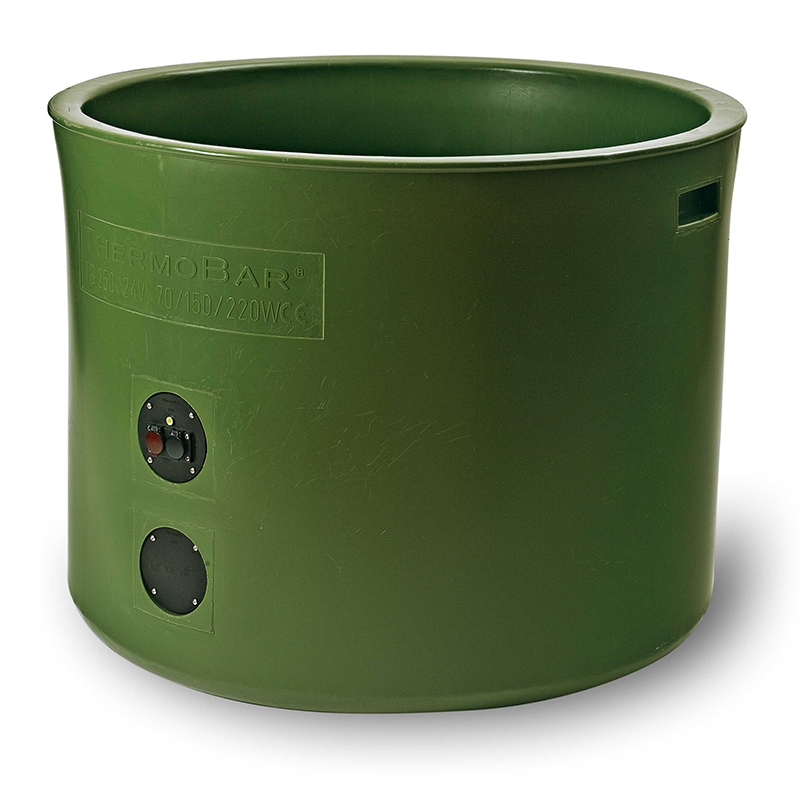 ThermoBar 250 is temperature controlled. It supplies water at the optimal temperature all year round, reduces power costs and eliminates the risk of overheating. There are two different power levels: 150 watts that is enough for temperatures down to approx. -25°C, and for colder conditions or when installing a float valve and heated hose there is a 220-watt model – perfect for temperatures down to approx. -40°C. Both versions are suitable for a float valve and summer refilling hose in the summer. It is delivered with a 2-metre, 10-metre or 20-metre low-voltage cable, transformer for outdoor use plus a two-metre 230-volt cable with a plug. Everything is mounted and ready to use – you just have to connect it to a regular electrical socket. The trough is prepared to be fitted with a LED light, float valve and heated hose or summer hose. The power usage for ThermoBar 250, according to power company Jämtkraft in 2015: 150 watts for 24 hours costs approximately SEK 3.60. 220 watts for 24 hours costs approx. SEK 5.30. The actual running cost will be lower than this because the thermostat turns the heating function on and off, keeping the water between 15 and 20 degrees Celsius. 1 low-voltage cable (choose between 2m, 10m, or 20m) 24 volt, with plug. 1 transformer, with a two-metre cable, 230 volt (150 watt). Low-voltage cable with 24-volt plug – 2 metres, 10 metres or 20 metres.